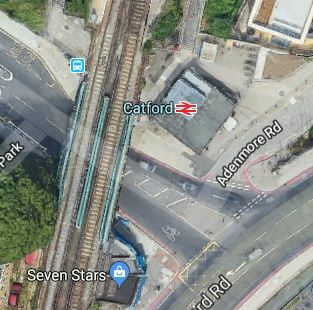 Catford station is on the list. This pictures show the current state of Catford station. The railway line is on an embankment, with a bridge over the road. There are steep stairs to both platforms. There are small shelters on both platforms. There is a small station building by the subway under the tracks. I suspect that a lift on either side of the tracks will need to be installed. It looks like it will be rather a tight squeeze to fit the lifts around the stairs and the current station building. I wouldn’t be surprised to see a rebuild of the current station building and the stairs, to create space for the lifts. The route between Catford and Catford Bridge stations used to involve a walk along the A205, but now there is a level walk through a new housing development, which also has a small supermarket. You enter Catford Bridge station, directly onto Platform 1. This Google Map shows the two stations and the walking route between them. I estimate that it is less than a hundred metres. Adding step-free access at Catford station will not complete the project. Look at these pictures of Catford Bridge station. To cross the tracks at the station, there are two bridges; the road bridge and a footbridge at the station. Neither of the bridges are step-free. It would be difficult to add lifts at the A205 end of the station, as there is little space. It would also mean passengers would be walking along the A205, with all its traffic and associated pollution. 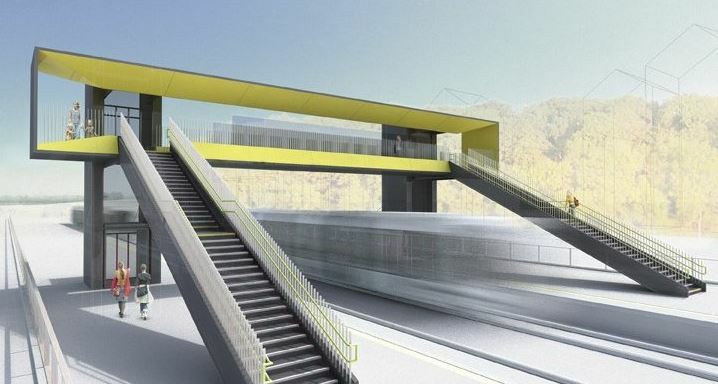 So could a factory-built bridge like this be installed at Catford Bridge station? It could replace the existing metal bridge! The North London Line will be my route to High Speed Two when it opens in 2026. I will actually have two Overground stations, that I will be able to use. Old Oak Common Lane station on the North London Line between Stratford and Richmond stations. Hythe Road station on the West London Line between Stratford and Clapham Junction stations. Wikipedia says that both stations should open in 2026, which is the same date as High Speed Two. Hythe Road station is 700 metres from the High Speed Two station. Old Oak Common Lane station is 350 metres from the High Speed Two station. Currently, both lines have a four trains per hour (tph) service. The Class 378 trains are five cars, which can get very busy in the Peak. It would need an additional five trains to increase the frequency to five tph on both routes. I feel the higher frequency could be in operation by the opening of High Speed Two. Most stations between Stratford and Willesden Junction would appear to be able to accept six-car trains, if selective door opening were to be used. I think by 2026, there will be a more than adequate service between Stratford and High Speed Two. There will be at least eight tph. Step-free access will not be available at Brondesbury Park, Brondesbury, Finchley Road & Frognal, Kentish Town West and Dalston Kingsland stations. But what other developments will or might happen? Highbury & Islington station is the thirteenth busiest station in the UK and it is in need of a major upgrade to bring the deep level platforms and their access up to the standard of the four London Overground platforms, which all have lifts. I also think that the track layout at the station could be modified to allow trains on the East London Line to continue further to the West. This was mentioned, when the Oveground was created, but is seldom talked about these days. These two lines which form a Y-shaped railway that splits at Willesden Junction, will provide these services from High Speed Two to major interchange stations. Four tph to Clapham Junction station. Eight tph to Highbury & Islington station. Four tph to Richmond station. 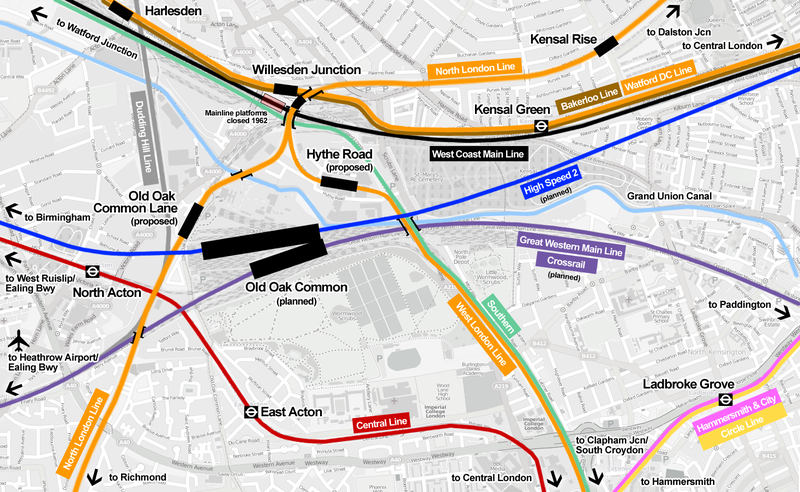 It looks to me that the Overground will connect High Speed Two to the parts of London, that Crossrail cannot reach. The only thing that is needed is to complete step free access at all stations on the North and West London Lines. Five tph on both the North and West London Line would give the following turnback frequencies at the four terminals. Note that it clearly shows that it is possible to run a six tph service between two single platform stations. I think it likely that it would be possible to run six tph on both routes, provided that the route and the signalling could handle the increased frequency. Twelve tph between Stratford and Willesden Junction stations would probably be the maximum frequency. But would the number of freight trains allow this frequency? Currently, the North London Line carries a lot of freight trains, going between Barking, Felixstowe and London Gateway in the East to virtually everywhere West of London. Noises from the East West Rail Consortium are hinting that services to and to and from Bristol, Liverpool, Manchester, South Wales, Southampton and the West Midlands might use their new route between Oxford and Cambridge. Could more freight use ports like Liverpool and Teesport in the North of England, which would reduce the traffic through the ports in the South? Whatever happens, the current succession of diesel-hauled freight trains across London is not environmentally-friendly and it will raise increasing numbers of protests. I think it is inevitable that the number of freight services will reduce, thus allowing more paths for passenger trains. To handle the increasing traffic on the North and West London Lines, I can see digital signalling being installed. There could even be a degree of Automic Train Control. Only a few stations can handle six-car trains without selective door opening and even the rebuilt West Hampstead station still has platforms for five-cars. Selective door opening would allow six-car trains to use the five-car platforms and passengers have in London have shown they can cope with moving forward to get out at certain stations. Especially, as the walk-through design of the train, makes this a lot easier. I can remember reading in Modern Railways, that one of the reasons for the East and North London Lines running parallel through Canonbury to Highbury & Islington was to possibly enable extension of the East London Line to perhaps Willesden Junction, where there is a handy bay platform. This has not happened and I doubt we’ll ever see something like a New Cross to Willesden Junction service, as Crossrail will effectively provide a faster frequent service between Whitechapel and Old Oak Common stations. The proposed West London Orbital Railway will have two routes. 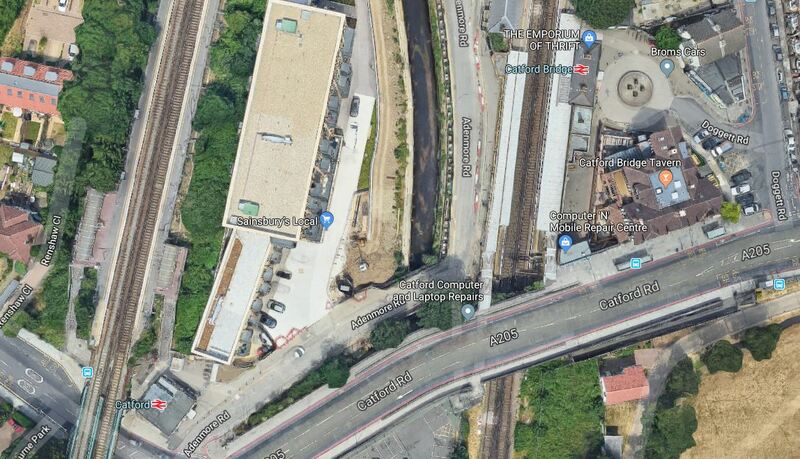 Both routes will have four tph and have a connection to Crossrail, High Speed Two and the North London Line at Old Oak Common station. The only possible problem would be the eight extra tph through Acton Central station and level crossing and South Acton station. But it would become an important feeder route to Crossrail, Heathrow Airport and High Speed Two. The North and West London Line route between Stratford and Willesden has the ability to handle a lot more traffic than it current does. Dgital signalling and six-car trains could add over another fifty per cent capacity to the route. I very much feel that digital signalling will be absolutely necessary. Is Wigan North Western Station Ready For High Speed Two? Wigan North Western station will be a stop used by High Speed Two and according to the Proposed Service Pattern in the Wikipedia entry, it will have at least one train per hour (tph). I took these pictures at the station during my overnight stay. A few thoughts about the station. According to a stationman, they can handle eleven-car Class 390 trains in the following platforms. The Northbound platforms 5 and 6. The South bound platform 4. As I arrived from Euston in an eleven-car train in Platform 5, I feel that he was correct. These eleven-car trains are over two hundred and fifty metres long. Wikipedia says this about trains for High Speed Two. Both types of train would have a maximum speed of at least 350 km/h (220 mph) and length of 200 metres (660 ft). Two units could be joined together for a 400-metre (1,300 ft) train. Wigan North Western station would accept a single-train now, but the platforms would need lengthening to handle a double-train. Kidbrooke Village is a new housing estate next to Kidbrooke station. Previously, the site was occupied by the Ferrier Estate. The estate has over five thousand units and several towers. I think we’re going to see a lot more developments like this. I think that a railway station with a frequent well-connected service is essential. Kidbroke has a train every ten minutes in both directions, with a choice of three London terminals. Developers like a rail service, as it makes units easier to sell or rent and the amount of car parking can be reduced. Hopefully Kidbrooke will be turned into a thriving community. A number of possible projects were outlined. A third track between Witham and Chelmsford. New tracks between Ipswich and Haughley Junction. these are my observations South of Colchester. Two extra tracks should be possible between Shenfield and Chelmsford, but there would be some bridge reconstruction and the problem of Ingatestone station. The third track between Witham and Chelmsford should be possible with only one major bridge South of Witham station. There would appear to be space to fit in two extra tracks between Marks Tey and Colchester. Although much of the line is only double-track, it does run through mainly farming country and there appears to be fairly wide green spaces on either side for much of the route. These are my observations between Ipswich and Haughley Junction. The line goes through the towns of Needham Market and Stowmarket and it would appear putting in extra tracks would be difficult in places. There are also several bridges and a couple of level crossings. But it does look like much of the route between Stowmarket Haughley Junction could have extra tracks added. Two bottle-necks were specifically mentioned. The Trowse swing bridge just South of Norwich. The later would allow more services into Norwich. Expansion of the station would allow more service to Cambridge, Lowestoft and Peterborough. I used to live near to Dullingham station, which is a commuter station for Cambridge. When I last used the station, it could do with more facilities. Will this policy be complemented by the reopening of sclosed stations? The article also talks about faster services and the improving of regional services. East Anglia is going to get much better rail services. When Are We Going To Get Some Rain? It’s now over a month since I experienced any rain and I feel totally crap, with a very dry month and I suspect dry lungs as well. I drinking lots of 0.5% alcohol beer, tea and lemonade, but it all seems to make no difference! I need a right royal downpour, so I can walk around in it.